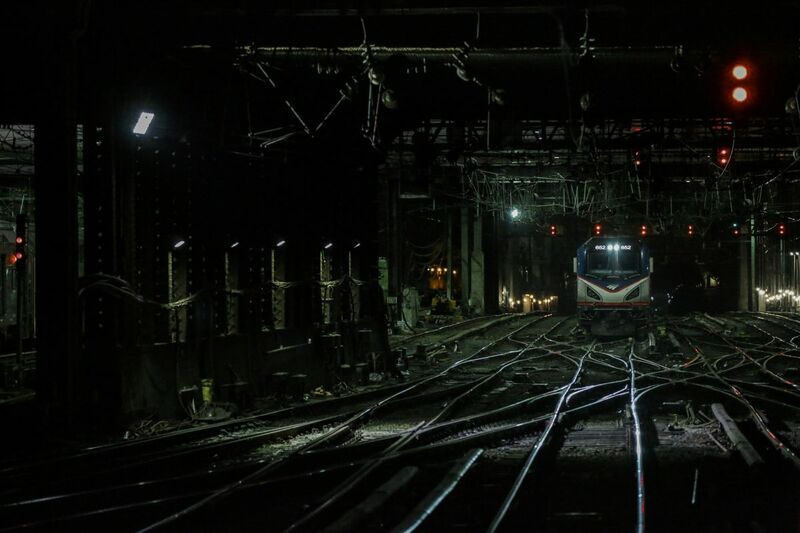 An Amtrak train moves along the track at Penn Station in New York, U.S., on Friday, July, 7, 2017. Bloomberg photo by Jeenah Moon. Amtrak says it's just one measure being considered as it seeks assurances that local governments will help fund needed improvements. Local officials and U.S. lawmakers from Kansas, Colorado and New Mexico said such a move would be devastating to their communities. "It's just frustrating that we didn't sit down and talk about how to do that nine months ago, before the bomb dropped on the busing," said Steve Cottrell, assistant to the city manager in Garden City, Kansas. Garden City is a stopping point for Amtrak's iconic Southwest Chief, which runs once a day in each direction between Chicago and Los Angeles. Lawmakers on the House Transportation and Infrastructure Committee's railroad panel Thursday grilled Scot Naparstek, Amtrak's executive vice president and chief operating officer, along with other railroad operators and U.S. regulators on the lack of progress installing a safety system known as positive train control. The system is supposed to be installed by Jan. 1, though some railroads say they won't make the deadline. The Southwest Chief, like many of the long-distance train routes outside the busy Boston-Washington corridor, brings in significantly less revenue than it costs to operate and the tracks Amtrak uses -- most of which are owned by Berkshire Hathaway Inc.'s BNSF Corp. -- are in need of millions of dollars in infrastructure investment. About 363,000 people rode the Chief in 2017, according to a June presentation by Richard Anderson, the passenger railroad's president and chief executive officer. It's one of the railroad's biggest money losers compared to other long-distance routes, he said. The line also lacks positive train control, which automatically prevents trains from colliding with each other and prevents engineers from accidentally going too fast. On 219 miles of BNSF's track, there are no longer any freight trains, so Amtrak is solely responsible for installing upgrades and the safety technology. Amtrak was roundly criticized last December when one of its trains derailed in Washington State on a route from Seattle to Portland that didn't have positive train control. The engineer was traveling 50 miles per hour over the speed limit, something positive train control is designed to prevent by automatically slowing a train in that situation. "Replacing rail service with bus service for the nearly 11-hour bus ride from Dodge City to Albuquerque would disrupt service for passengers, increase barriers to travel and hobble local economies," Sen. Thomas Udall, D-N.M., said in an email. "On top of that, trading trains for buses is less safe and reduces ridership." But Amtrak officials have told local governments that their board of directors' policy is to err on the side of safety and have the system on all its routes. The Raton Pass in northern New Mexico is the steepest mainline railroad grade in the U.S., making the need for the safety system even more critical, they said. "Last month, Amtrak officials met with stakeholders from New Mexico, Colorado and Kansas to review the challenges associated with a limited portion of the existing Southwest Chief route and possible changes to service for that segment," said Amtrak spokeswoman Christina Leeds. "At present, no changes to the current service have been made and we are working with various stakeholders on long-term options to address the unique capital and operating costs associated with Amtrak's operation over these segments owned by BNSF Railway and the State of New Mexico," Leeds said. Naparstek, who wasn't asked directly about the bus plan in Thursday's hearing, said the railroad is conducting "detailed risk assessments" to determine how it should proceed on segments such as the Southwest Chief. The railroad's goal "is to continue to operate all of our services over all our current routes come Jan. 1, 2019," he said. Accident investigators are concerned about the sectors of track on which the safety system isn't required, Robert Sumwalt, chairman of the National Transportation Safety Board, told lawmakers. About 40 percent of railroad tracks in the U.S. won't have to have the system, and that includes 1,400 miles of Amtrak routes, Sumwalt said. "If Amtrak continues to operate on those segments, there will be a diminished level of safety for passengers and train crews who are traveling through communities such as Topeka, Kansas; Grand Junction, Colorado; Portland, Maine; Memphis, Tennessee; New Orleans; Saint Louis and many others," he said. In Vermont, Sen. Patrick Leahy, D-Vt., believes Amtrak has "sent too many mixed signals'' about whether it will continue train service on two lines without positive train control, said his spokesman David Carle. The railroad hasn't responded to Leahy's request to say whether or not it plans to suspend service, Carle said. Leeds said that "Amtrak's aim is to continue service across all of its network, including the routes in Vermont, and to ensure that we can do so with a common level of safety." BNSF, which owns most of the Southwest Chief's track, has installed the technology on all 11,500 miles of track on which it's required, spokeswoman Amy Casas said. The company is also installing it in some but not all sections where it's not required, Casas said. Federal mandates include an exemption for lightly traveled tracks. If buses are used for a stretch of track that's almost 600 miles long, it would kill demand for the train, said Evan Stair, an activist who runs a group called Passenger Rail Oklahoma that is also active in Kansas and other states where the Southwest Chief operates. The bus plan would "only further the great divide between the urban and rural communities in this country," Dodge City Mayor E. Kent Smoll, said in a statement. "We have Dodge City residents who rely heavily on these services particularly the elderly and disabled who do not desire to fly or drive long distances." Still, local governments remain frustrated with what they see as a sudden change in Amtrak's policy on the Southwest Chief and the railroad's demands for guaranteed funding for the line, Sauble said. "Nobody is arguing that PTC or some safety feature isn't necessary," he said. "It's just the time table for getting it installed."